Today, “soccer” is not a top 4 sport in the United States. But give it 5 years, and it will be. 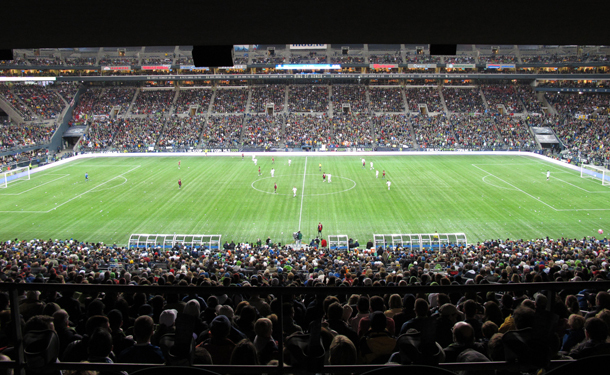 It is undisputed that far more people around the world are playing soccer than any other sport. More than basketball, American football, baseball, ice hockey and any other sport Americans are engulfed in. You can visit any crevice in this great earth, and you will find children and adults alike who absolutely idolize a certain Cristiano Ronaldo or perhaps one Lionel Messi. The simple fact is that soccer is more talked and thought about than any other concept, subject, or event in human life. To put it in perspective, on a global scale Cristiano Ronaldo is more recognized than President Barack Obama, Jay-Z, and yes, even ‘King’ LeBron James. But how can it be that soccer is worshipped everywhere but in America? The answer- exposure. American adolescents have been playing the sport in novice leagues and school organized games for decades, but these inexperienced yet potential-filled kids have never been able to watch the best players in the world- the professionals. It is near impossible to emulate a counter-attacking formation if it cannot be watched, and if it cannot be watched, it cannot be appreciated. It is due to this that once Americans outgrow their ability to partake, their interest dwindles. On the other end of the spectrum, hockey fans can enjoy the National Hockey League after they hang up their skates. Though in recent years with the likes of Fox Soccer and Gol TV broadcasting top tier European matches, the people that wanted to watch the beautiful game could. The problem with this, however, is that the people subscribing to these channels were people already equipped with an interest in the sport. Soccer had made its way into televisions across the pond, but it was still being kept at a distance from the American masses. Today though, I am thrilled to be able to lie on my couch and watch frightening amounts of English Premier League soccer, as is every American with basic cable! NBC’s winning bid of $250 million for 3 years meant the network would be able to broadcast all Premier League matches. This is the very first time that a non-U.S. located league will regularly be televised on a national level. Nation-wide exposure could not have come into existence at a better time. Soccer’s biggest stage, the World Cup, will take place in Brazil during the summer of 2014. American kids out of school will be able to watch nearly every minute of the events in Brazil as they happen. With the American National team as strong as ever, there will be every reason to cheer on our country. Soccer, America is nearly ready for you.